Overseas Workers Welfare Administration (OWWA ) is an agency under the Department of Labor and Employment that focuses on the protection of our Overseas Filipino Workers and their families, mainly in providing social security, cultural services and help with employment, remittances and legal matters. 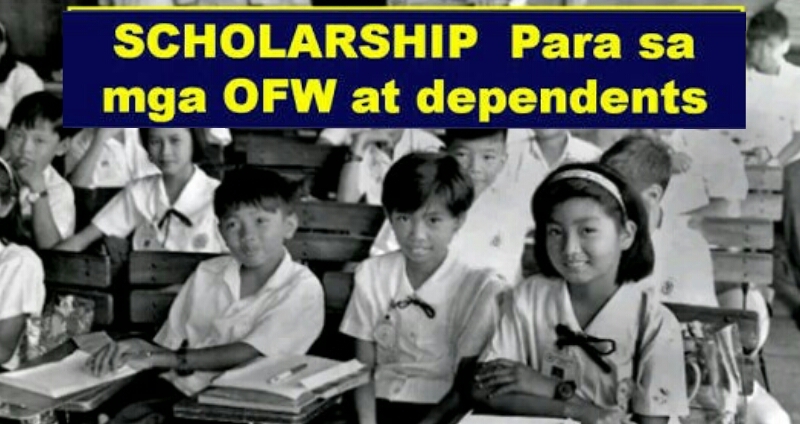 Part of the programs of OWWA to help our OFWs and their families is the Education for Development Scholarship Program (EDSP) and OWWA Dependent Scholarship Program (OFWDSP). EDSP aims to provide a maximum grant of P 60,000 per year for any OFW Beneficiary or Dependent who wish or is already enrolled in any 4-5 year college course in any university across the country, may it be a state university or college and Technical Education and Skills Development Authority (TESDA)- accredited institution or privately owned tertiary or vocational institution, whichever they prefer. On the other hand, OFWDSP is offered to any OFW Beneficiary or Dependent that are planning to or currently studying in a state college or university and whose family member receives a monthly salary that is not higher than $400 (30,478.00). This scholarship covers P20,000 of a student’s school expenses per school year. But since state colleges have now free tuition, the money grant should strictly be used for other school fees or for other academic-related expenses only. Upon approval, EDSP and OFWDSP shall take effect on the school year 2019. Skills for Employment Scholarship (SES) , Seafarer’s Upgrading Program (SUP) , DOLE-OWWA– Tulay Microsoft Project and Tuloy-Aral Project. 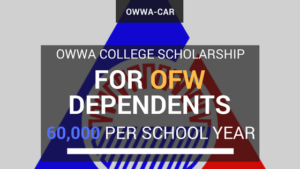 OWWA gives P30,000 per semester and pay the tuition fee directly to the school. They release each amount after the scholar submits his/her grades from the previous semester. 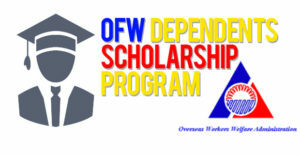 The applicant must not receive any other scholarship grant, is the only family member (child or sibling) of the OFW receiving EDSP and has not previously taken any OWWA scholarship qualifying exam. If you are qualified for a scholarship after thorough checking, bring your complete requirements as mentioned above to the nearest OWWA office to avail of the scholarship. Visit the OWWA Website for more information.